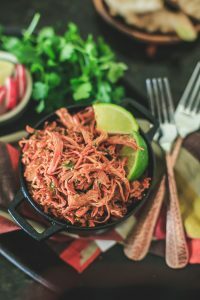 So many of you have been asking for Instant Pot recipes to make your weeknight meals easier or for the ease of meal prep! 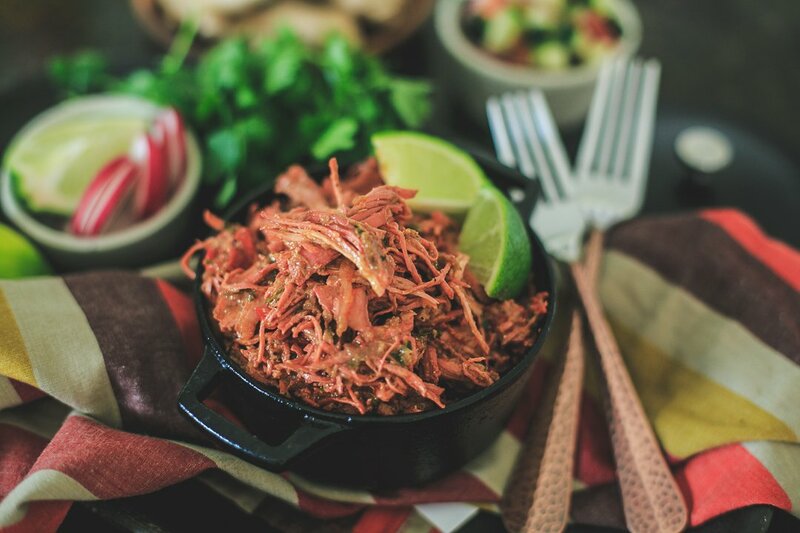 This IP shredded tandoori chicken is great for just about anything! I’ve made this three times already and each time we’ve eaten it in a different form. I’ve topped on some Stone Fire flat bread and topped it with my Jalapeno Cilantro Sauce, I’ve served it with a simple salad of cucumbers+tomoatoes+onions with a dollop of yogurt (the healthy way) AND I’ve also used it as a stuffing in puff pastry- with some cheese and the cilantro chutney from my Mexican Papdi Chaat Recipe!! So yeah, its pretty damn versatile. This recipe may vary a bit in how much liquid you end up for many reasons. How juicy your peppers are, your yogurt consistency, if your chicken amount is slightly less or more than what I used- but don’t worry..it’s extremely easy to adjust and once you make it you’ll get an idea of if you like it to be more juicy or less juicy. If im using it on a pizza- I obviously want it to have less liquid because I don’t want a soggy pizza! If I’m using it for meal prep or serving it alone- I would want a little bit more liquid- etc. I’ve given some advice on how to work around this in the recipe below! Turn the Instant Pot on Saute mode and add oil. Once oil is hot add the serrano chilis and cumin seeds and let splutter for about 30 seconds. Add the bay leaf, cinnamon stick, cardamom pod stirring constantly so the spices do not burn but are just golden and aromatic, about another 30 seconds or so. Add in the sliced onions and peppers and continue to stir. Add the garlic and ginger and cook for 3-4 minutes. 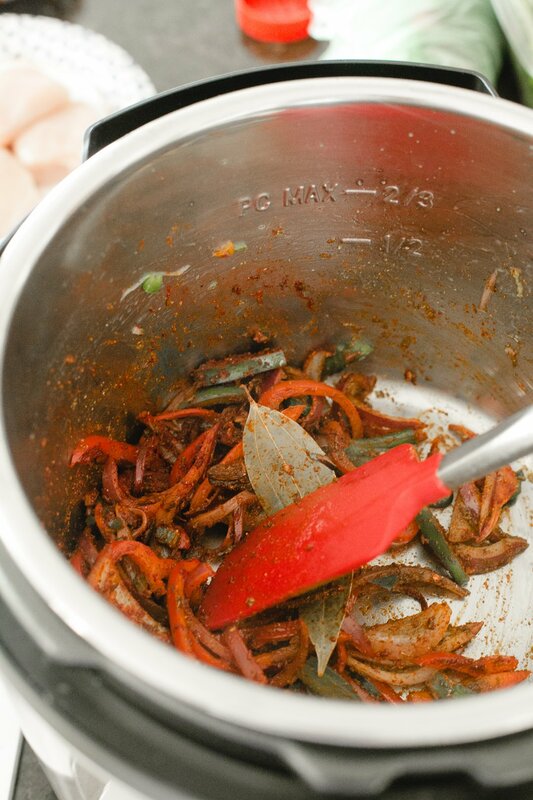 Add the remaining dry spices to the pot and continue to cook for an additional 3-4 minutes. 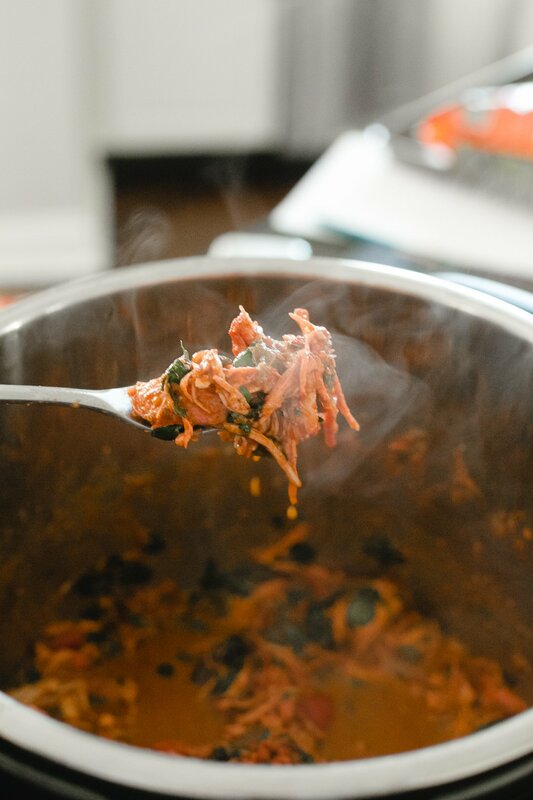 Hit "cancel" on the Instant Pot and the chicken and yogurt to the pot- using your spatula to lift up any browned spices at the bottom of the pot. Mix well and set the Instant Pot to "Pressure Cook" mode and pressure cook on high for 5 minutes and let natural release. 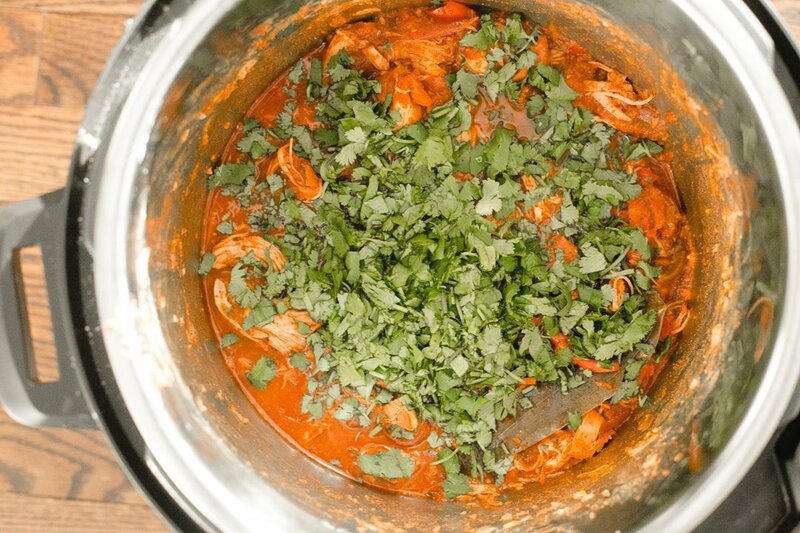 Open the lid, add in the squeeze of lime and cilantro, mix well. Use two forks or clean hands to shred the chicken. As the chicken gets shredded and sits in the pot it will absorb additional liquid in the pot. If it is too much liquid turn on the saute mode and let some of the liquid evaporate. If you want more liquid- you can still add more yogurt or splash of chicken broth and saute on low mode for a few minutes. 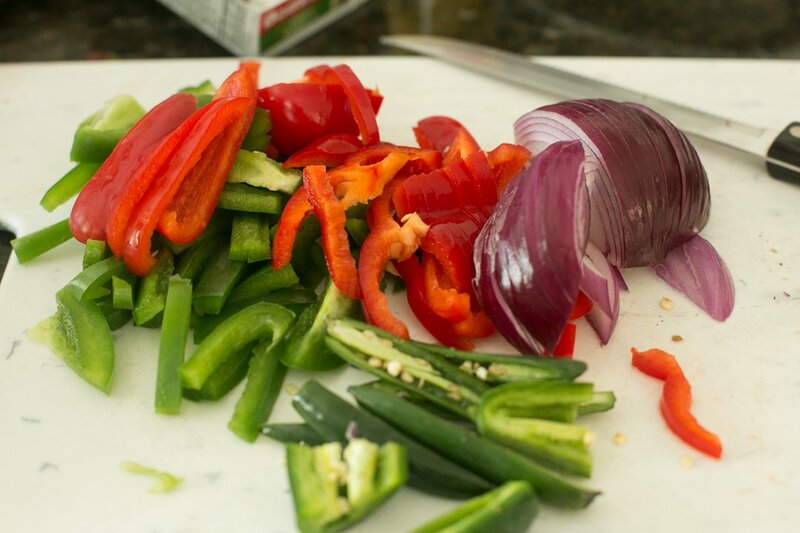 Serve hot with side of salad and rice, use it as a filling for sliders, or top it on a flatbread. It is very versatile.